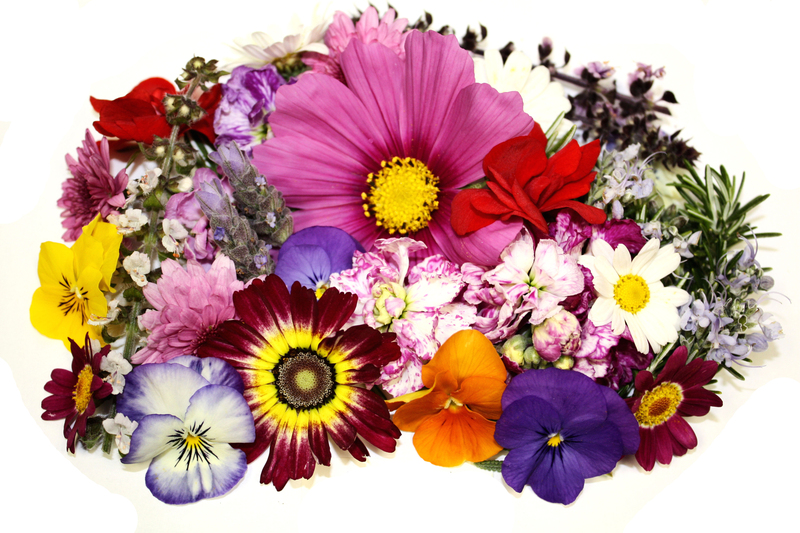 Celebrating Motherhood: Fresh Origins’ Edible Spring Flowers! Mother’s Day is upon us and that can only mean one thing, our selection of Edible Flowers, including Herb Blossoms, Vegetable Blossoms, and MicroFlowers are blooming brightly! We are offering a large variety this season including, Basil Blossoms, Buzz Buttons, Nasturtium Flowers, Cilantro Blossoms, Marigold Flowers, Jasmine Flowers, Cosmos Flowers, MicroFlowers™ Orchid, the list goes on! Need Ideas for Mother’s Day? Brighten up her special day with Edible Flowers! If you’re at that point where you are stuck wondering what to do for Mother’s Day and you’ve already taken the traditional route — the thank-you card and bouquet of flowers combination — do something different this time! Create a gorgeous Mother’s Day meal by adding our Edible Flowers to your appetizers, entrees, soups, salads, desserts and cocktails. Be sure to notice what each different flower has to offer. Whether you’re adding a hint of citrus with Buzz Buttons over a sorbet or looking to top off an entree with the peppery, spiciness of Nasturtium Flowers, show mom how much you love and appreciate her with your creative side. Have fun with it! 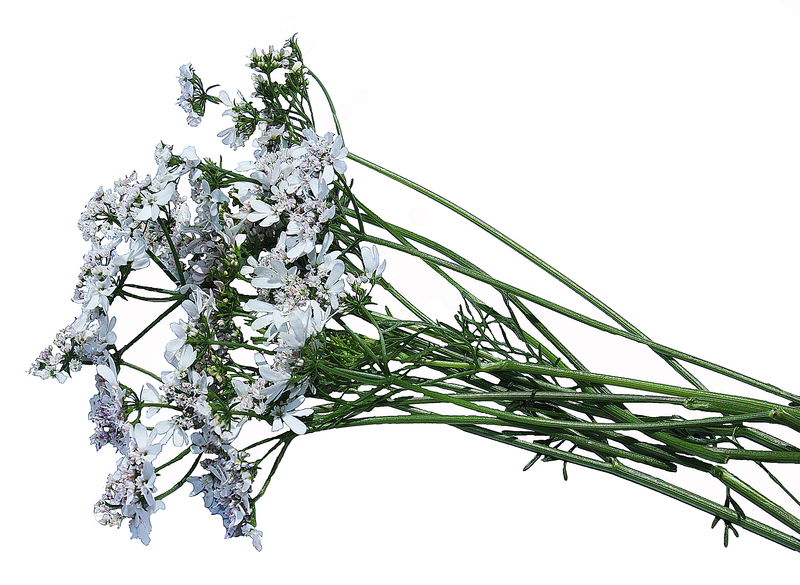 Below are descriptions of our most popular flowers, how they generally taste, how you could possibly use them, plus recipes with Edible Flowers as ingredients! Basil is everyone’s favorite herb flower and hopefully your mom’s favorite too. 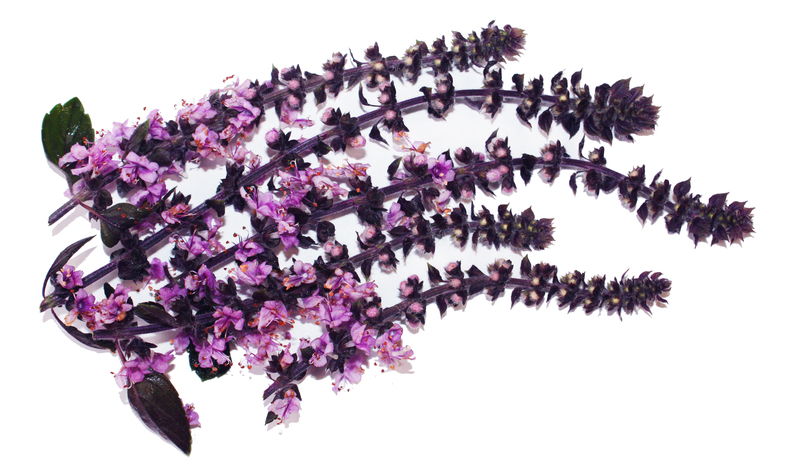 This dazzling purple blossom has even more concentrated flavor and aroma than the leaf. Usually, people will smell the sweet aroma & see its stunning appearance right before they enjoy the fresh taste, engaging all their senses. Very versatile, it can be used whole or shredded. In a small saucepan, combine the water, sugar, lemon zest, lemon juice, cointreau and orange juice. Bring to a simmer and cook until the sugar is dissolved, about 10 minutes. Add the basil and set aside to steep for 3 minutes. Strain syrup through a fine chinois and set aside to cool. Transfer to the refrigerator until thoroughly chilled, then process in an ice cream machine according to manufacturer’s directions. Coat a saucepot with oil and warm over medium-low heat. Add the onion and garlic and cook, stirring, until soft. Add the tomatoes, sugar, tomato paste, chicken stock, and wine; season with salt, pepper and crushed red pepper. Turn the heat up slightly to medium and simmer the sauce for 10 minutes, stirring occasionally. Stir in the basil and cheese. Cut peach into small pieces and add to a shaker. Take 2 Fresh Origins Basil Blossoms, torn into pieces and squeezed lemon, and add to shaker and muddle. Add Vodka, Chambord, Peach Schnapps, and Orange Juice. Shake vigorously; pour into ice filled Collins glass. Garnish with 2 Basil Blossoms, and peach slices. In a bowl, combine cream cheese, salmon, dill, and lemon juice. Mix and season with salt, pepper, and paprika. Mix in capers. 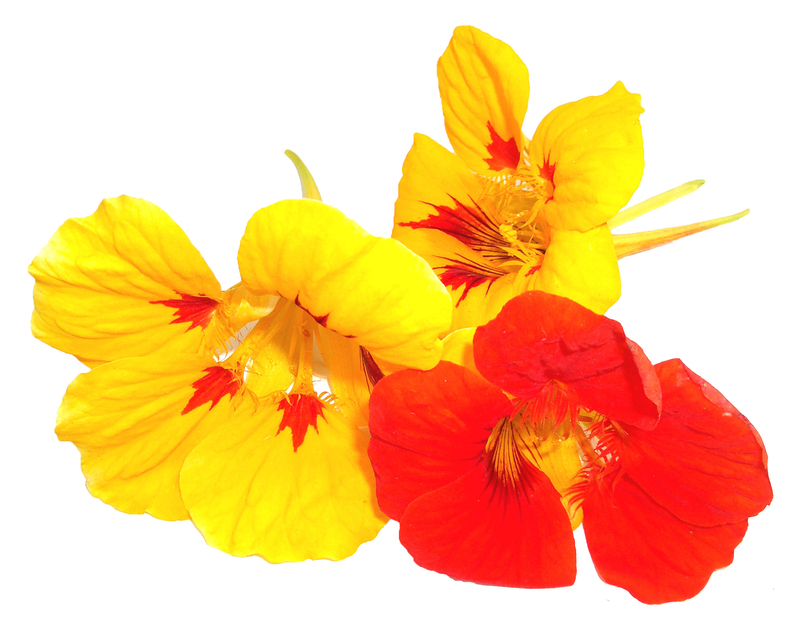 Place about half a tsp cream cheese mixture (more or less, depending on the size of the flowers) inside the throat of each nasturtium flower. Fold each petal over the cheese and press together. Toss the potatoes with melted butter and tarragon; put on a baking sheet. Roast for 25 to 30 minutes, or until tender. Chop in quarters. Mash half of the potatoes gently. Sprinkle with the salt, pepper and paprika. Refrigerate until cold. Toss together the cooled potatoes with: parsley, capers, mustard, mayonnaise, eggs, green onions, vinegar, in a large bowl. Season with salt and pepper to taste. Add the chopped nasturtiums and toss to combine. Cut 5 Buzz Buttons™ into pieces, put in a blender. Add Sweet and Sour, Citrus Rum, Blue Curacao, and juice from half of a lime. Blend mixture then pour into a glass filled with ice. Top with a float of Cachaca. Serve with 1 Buzz Button™ for garnish, but be sure to caution your customers of their tingly sensation. Since alcohol dehydrates you, the Buzz Button™ is a perfect ingredient because it stimulates salivary glands, keeping your mouth from getting dry and giving you a refreshing hydrated feeling! Citrus Buerre Blanc with a kick! In a hot small saucepan, add shallots and juices. Simmer and reduce until au sec (nearly dry, about 1 tbsp of liquid left). Add Buzz Buttons™, salt, & pepper. Take off heat and add a few cubes of butter at a time, whisk quickly and constantly until melted. Careful not to “break” the sauce (separation of fat and liquid). This will happen if it is too hot. The finished sauce should be thick and smooth. Blend the lime juice, vinegar, and cilantro together in a blender until smooth. Add the brown sugar, garlic, and salt, pepper; blend again until smooth. Spoon the mustard into the mixture. Turn the blender on and slowly pour the olive oil into the dressing mixture in a thin stream; blend until thoroughly combined. Combine salt, pepper, paprika, cumin, cayenne, lime juice, garlic & jalapeno . Put on shrimp. Add shrimp to a hot grill and cook, until opaque throughout, and caramelized on both sides. 3 to 5 minutes. Serve shrimp with Cilantro Flowers & lime wedges. In a blender, puree the spinach with 2 cups of the chicken broth. Add the cilantro and coarsely blend. In a large saucepan, melt the butter and sauté the onions, garlic and serranos. Add the pureed mixture and the remaining chicken broth. Simmer for 10 minutes. Meanwhile slice the avocados and drizzle with lime juice. Thin the soup, if necessary, with additional chicken broth, then pour into bowls and garnish each with cheese, avocado slices and a Cilantro Blossoms. Borage Blossoms, Marigolds, Begonias, Snapdragons, Chocolate Bell Flowers, Fava Flowers, Nasturtiums, Lavender Flowers, Buzz Buttons, Cilantro Blossoms, Mustard Blossoms, Cosmos, Jasmine Flowers, Alyssum Flowers, Arugula Blossoms, Chive Blossoms, Bachelor’s Buttons, Firestix™, Calendulas, Fennel Flowers, Fuchsias, Pansies, Violas, Sparklers™, Thyme Blossoms, and all of our MicroFlowers™ varieties. If we were able to help to you in any way this Mother’s Day, let us know! 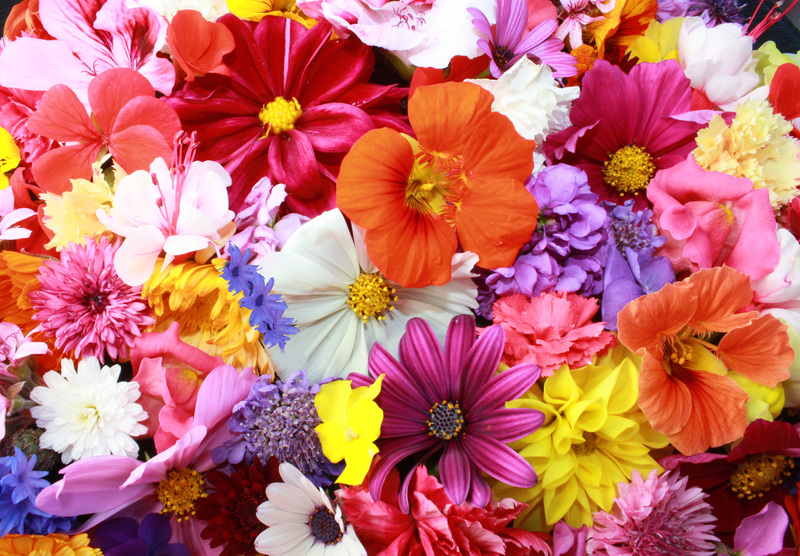 We love hearing what other Chefs and food fanatics are doing with Edible Flowers. But most importantly, to all the Mothers out there, we’re so grateful to have you and wish you the best Mother’s Day ever! This entry was posted on May 8, 2013 at 8:22 pm and is filed under Edible Flowers, Recipes. You can follow any responses to this entry through the RSS 2.0 feed. You can leave a response, or trackback from your own site.